Unstable angina pectoris refers to a specific type of chest pain (angina) that occurs irregardless of the exertion status of the patient (patients at rest may randomly experience this chest pain). It is thought to be often caused by a thrombosis with incomplete coronary artery occlusion. It belongs to a broader category of diseases called acute coronary syndromes (ACS). 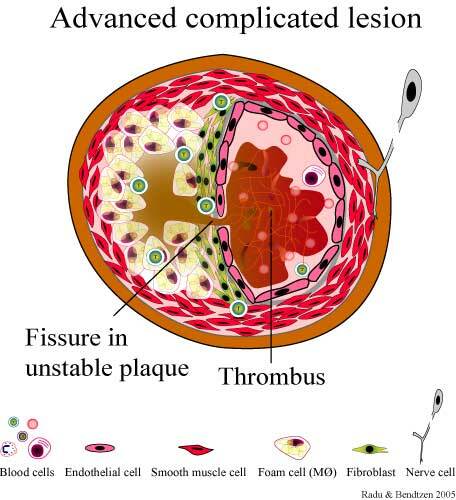 Often this condition arises when there is rupture of an atherosclerotic plaque with thrombosis which leads to incomplete occlusion of coronary artery. This is a problem because it can lead to random episodes of ischemia to the myocardium, and has a high risk of progression to an MI because complete occlusion of the vessel can occur. Chest pain: that occurs, intensifies, or increases in frequency when the patient is at rest. Dyspnea can also be experienced. EKG: ST depressions or T wave inversions may be present on an EKG (when the patient is at rest). This is not a requirement. Subendocardial ischemia is the cause of ST depressions. Absence of ST elevations is required for a process such as unstable angina. ST elevations are diagnostic for a STEMI. Lack of cardiac enzyme elevation: the absence of cardiac biomarkers elevation (such as troponin I) will be able to differentiate better unstable angina and a more serious NSTEMI (which can also have similar EKG findings). Symptom control with nitrates and morphine which can relive the pain. Aspirin, heparin, and clopidogrel can assist with anticoagulation prophylaxis. Beta-blockers (ex. metoprolol) while decrease the oxygen requirements of the heart by decreasing contractility. Statins will be beneficial in reducing cholesterol levels in these patients (long term management). This will depend on a variety of factors, however unstable angina is a serious sign that there is significant occlusion in the coronary arteries. Preventing coronary artery disease/atherosclerosis is perhaps one of the best ways to prevent the development of stable angina. Reversible ischemia is the cause of unstable angina. There is no necrosis of the myocardium (which is why cardiac enzymes are not elevated).